Replicated Tasks with Advanced Task Scheduler Network | The official site of Advanced Task Scheduler software. Advanced Task Scheduler Network Edition introduces the "Replicated tasks" group. Tasks from that group can be redistributed over the network to various computers where Advanced Task Scheduler Network is installed. "Replication" means copying replicated tasks and settings from one machine to another over TCP/IP network periodically with flexible intervals which can be minutely, hourly or daily, or manually by "Replicate now" command from "Options" menu. "Replicated tasks and settings" means scheduled tasks from the "Replicated tasks" group and settings associated with that group. Each root group in Advanced Task Scheduler has its own settings such as log file and email options, user account options, holidays, credentials. These settings are replicated along with tasks. 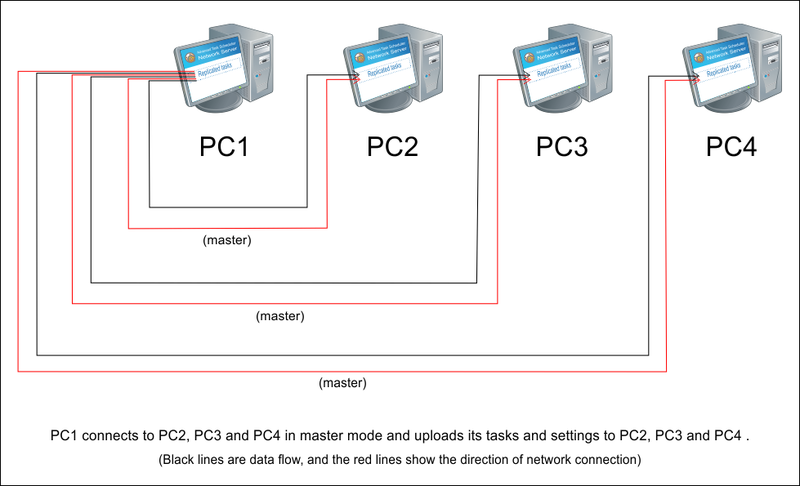 In master mode the primary server uploads its replicated tasks and settings to secondary servers. Once a task is added or modified on primary server, the changes will appear on secondary servers on the next replication cycle. In slave mode secondary servers download their replicated tasks and settings from primary server. Once a task is added or modified on primary server, the changes will appear on secondary servers on the next replication cycle. Replication modes and directions of network connection can be mixed. This may be useful to optimize network load and firewall configurations. 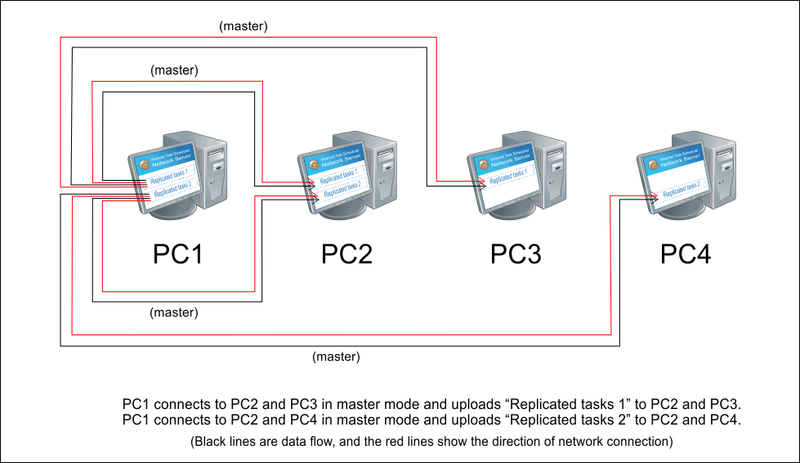 More than one "Replicated tasks" groups can be used. You can find more information on adding extra root groups here: Advanced Task Scheduler's SQLite database. Strict mode makes full copy of replicated tasks and settings. If a task on primary server has different modification date than on secondary server, the task is updated to secondary server. If settings on primary server have different modification date than on secondary server, they are updated to secondary server. If secondary server has a task that does not exist on primary server, it's deleted. Easy mode updates only tasks and settings that modified on primary server later than on secondary server. If secondary server has a task that does not exist on primary server, it's ignored. You can edit replication options in the "Replicated" section of the "Preferences" window. Every time a replication is performed, it can write its results to a file or send them by email. If your tasks and settings are encrypted and password-protected, you still can use the replication feature, but you'll need to specify your password in options. 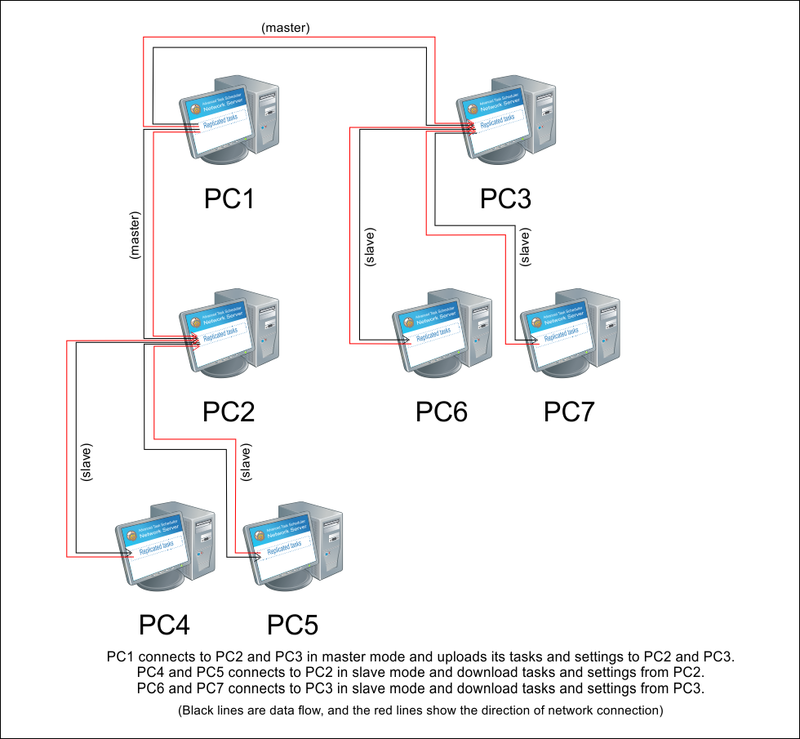 Network restrictions can be set up to restrict connection mode and IP addresses for each machine in Advanced Task Scheduler Network Server's options. All machines must have the same version of Advanced Task Scheduler Network Server installed, otherwise the replication process will fail. Use "Environment variables" where possible in your tasks as different machines may have different paths. Log files and email subjects can include "Environment variables" too. All network connections use SSL encryption, so they can't be intercepted or viewed by third parties.